Description characteristic of the mineral. Ammolite mother-of-pearl, nacre was acknowledged a mineral recently - only in 1981 It mineral offtype. 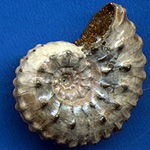 It is petrifying Mother-of-pearl, Nacre of fossil shells of ancient fossil minerals Cephalopodas of shellfishes - ammonites. 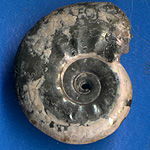 Now and then the processes of mineralization of shells of ammonites in composition siltages went at terms which was instrumental in education from them of new rare mineral. The shells of ammonites meet in many places of Earth, however Ammolite mother-of-pearl, nacre is obtained only on territory of province of Albert in Canada. 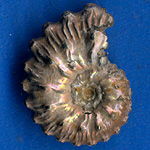 Quality and cost of ammolites depend on riches of their colouring. It can be yellow, orange, green, dark blue. Curiously, that this colouring is conditioned not pigments, but only exceptionally by the refraction of light in the layers of petrifying fossil mother of pearl. Ammolite mother-of-pearl, nacre - mineral soft, therefore at making of decorations his pieces strengthen frames, fixing on different substratum bottom layer . Curiously, that fossil mother-of-pearl nacre ammolite (in fairy tale "the magic seven-petal flower") since olden times was used as amulets by Canadian American Indians. They named the ammolite stone of bison, as some pieces of these minerals, washed brooks and rivers, reminded on a form these animals. The pied painted copies of ammolites are most valued in our days, which name the seven-coloured stone of prosperity. It is considered that an amulet from ammonites and ammolites in a house is instrumental in economic expansion and domestic happiness. If such Ammolite mother-of-pearl, nacre to bring to the office, it will bring success to businesses. Free download article Very dangerous and potentially dangerous stone and minerals are in Medical stone therapeutics, with pictures, 2010 year, format of PDF, 2.80 Mb (Presentation from scientific of author K.305 of pictures of very dangerous and potentially dangerous natural stone and minerals which on a bad motive or criminal indifference can be illegally used in criminal and "underground" "Medical stone therapeutics"). Rus langv.